Are you using an irrigation system to save money? Do you have the right one for you? Humans have used irrigation for hundreds of years. We do it because it saves time, money, and labor. For growing indoors, drip irrigation is the ideal automatic watering method. In a greenhouse humidity and the pathogens that enjoy it are more of an issue. Drip irrigation reduces that water applied and prevents the humidity from rising too quickly. For growing outdoors in a field, a sprinkler system makes more sense because of the larger area. Do your homework or work with a professional – only an effective irrigation system can create the benefits desired, like lowering the risk of disease by eliminating soaked areas. Set up the irrigation system correctly for equal distribution – equal distribution means your plants will receive the right amount of water evenly and continually. When this happens, healthier plants and higher yields will be the result. Set up the tubes and pipes appropriately – this can conserve as much as 50% of water usage by allowing the water to be delivered only in the places it should, so watering in wasted places are eliminated. Maintain your irrigation system properly – an irrigation system should continuously be maintained to be most effective. As a result, pH balances will also remain more balanced because of the even and continuous flow. Diseases are also reduced because soaking creates diseases as the plant suffers from water build up. Higher yields – because the water is being delivered regularly, plant growth will eliminate plant damage. This results in bigger yields. 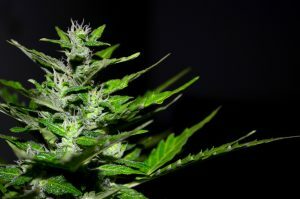 Faster growing time – with fewer problems getting in the way of the growth process, the plants can flourish. Less labor needed to grow plants. Automatic systems reduce labor, uneven plant growth, and water waste. 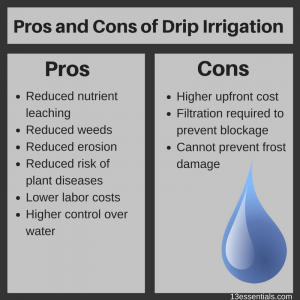 There are two primary automatic irrigation systems you should consider drip and sprinkler. Drip irrigation is more expensive to install but uses less water and reduces the chances of diseases. Sprinkler systems are cheaper to install, but use more water and increases the likelihood of diseases.Ask a professional which system and layout are best for you. Maintain your system and check pH, debris, and Electricoconductivity (EC) or Total Dissolved Solids (TDS). With the correct maintained system you’ll have healthy happy plants.